HI, Friends, Fans and Family, it was a great weekend in Atlanta. Sorry I haven’t checked in before now. Got some rubber from the track Sunday morning right where this crash happened. I am convinced it is from Reed’s car. Also got a piece of metal. No clue which car it came off of, but it is NASCAR metal and I like it. When it becomes a piece of jewelry I’ll share a picture. The people from Speedway Children’s Charities were AWESOME. If you happen to be in Atlanta find out what you can do to help these people out. They are doing some great work for some great kids. Got to meet some family for the first time which was great too. I got to eat at the Varsity, you just can’t beat a frosted orange and those onion rings. It was close to midnight every night when I got home and I was up and at it again between 6 and 7 every morning. Came back Monday and back to work Tuesday morning. Soooo, yes I am recovering. Of course I still have the glow of the fabulous weekend so life is good. I’ve been waiting since I left the track last year to go back and the day has finally arrived. I leave today after work to head to Atlanta. Leaving my son here at home. Everyone asks why are you going alone. I’m not going to be alone. Last year there were 111,000 plus in attendance. I do have several people I know who will be there and always make new friends. So in just under 11 hours now I will be on my way for my annual trip to Atlanta Motor Speedway. A great day to celebrate my 100th blog post. Will try and blog while I’m gone but no promises. So here are some racing pictures to celebrat the day. 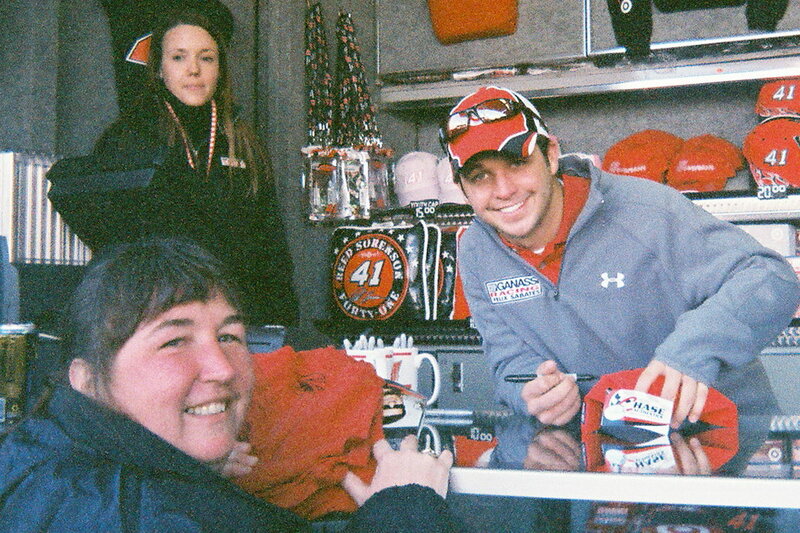 My picture with Reed at the 2008 March race. Thanks for supporting my blog through my 100 often rambling, sometimes senseless, hopefully entertaining posts. Stay tuned for more fun in the next 100 posts. In just 9 days I will be more than halfway to Atlanta for my Spectacular Racing Weekend. 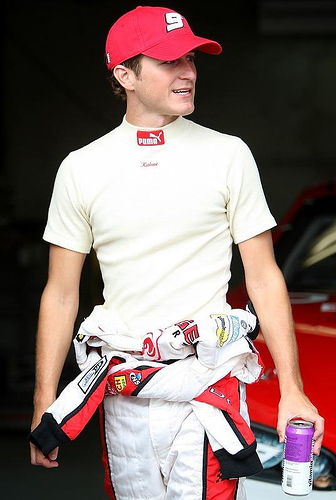 One of the drivers I believe I will be seeing on Friday, September 2 at the Reed Sorenson Charity Golf Classic is none other than the driver of the Number 9, Kasey Kahne. Kasey was there last year to support his then teammate Reed and I understand he’ll be back this year. He is every bit as cute in real life as he is on TV. Luckily he didn’t drive by when I was driving a golf cart so I didn’t crash into anything like those ladies on the commercial. Be sure and check back tomorrow for my 100th post. I’ll give you a clue I’ll have 8 days left on my countdown clock…. Until I leave the sunny shores of Florida and head to my hometown Atlanta to spend the weekend immersed in Nascar. Reed Sorenson Charity Golf Tournament Friday morning, festivities at the Track Friday night, Saturday ohhhh my volunteering with Speedway Children’s Charities, Qualifying (Nationwide and Cup) Nationwide Race. Sunday, Sunday, Sunday… Track Walk, getting to visit the pits (have I told you all I HAVE A PIT PASS and I’m so excited I can’t stand it) and then the big event Sprint Cup Racing under the lights. Then Monday morning breakfast at the track on Bruton Smith. 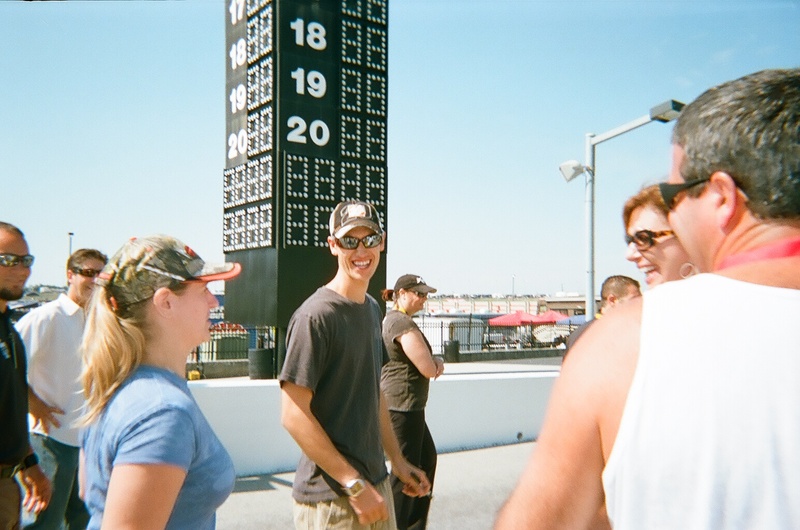 So with 18 days to go I must post a picture of Kyle Busch and tell you my personal tale of Kyle. I hated Kyle Busch. Hated, despised, deplored, booed him at the track, wished him to crash (not get hurt just wreck the car). I did not like him here or there I didn’t not like him anywhere. But knowing it was wrong to hate someone sooooo much I prayed that God would help me not hate Kyle Busch and it worked. I’d still be hard pressed to say I’m a fan but I don’t cringe everytime I see him or hear his name. I actually hope he wins a race now and then and was glad to see him win the Nationwide Championship last year. Love him or hate him you’ve got to admit the boy will flat sure drive the wheels off a car to win a race and as I am fond of saying to my son, not only would he (and he has) put his brother into the wall he’d put his own mama in to the wall to win a race. 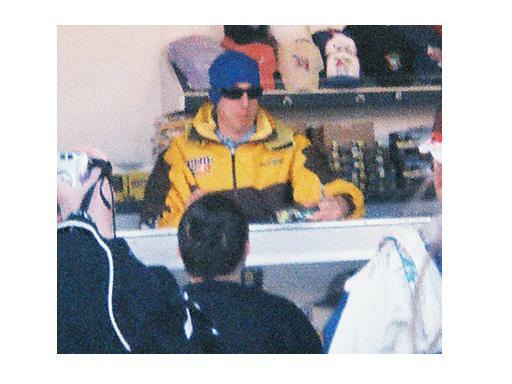 So here’s a picture of Kyle at Atlanta Motor Speedway the year of the Snow, 2008. It’s only twenty, count them twenty days until I’m on my way to Atlanta for a weekend of Nascar. So how could we do day 20 without the two most recent drivers of the #20, Tony Stewart and Joey Logano. Haven’t had the chance to get anywhere near Tony at the track so I had to find a picture of him, but the picture of Joey Logano is from Track Walk for Speedway Children’s Charities at Atlanta Motor Speedway last year. Looking forward to seeing Joey there again in just a few weeks. So here you have it. 20/20 the past and the present drivers of the #20 Tony Stewart and Joey Logano. 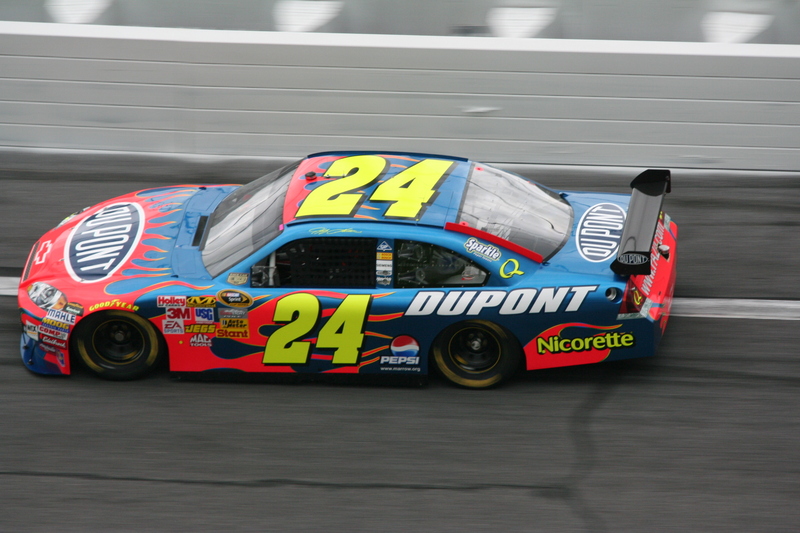 Yes it is Jeff Gordon’s number but it is also the number of days until I leave for Racing under the lights at Atlanta Motor Speedway. It’s going to be awesome, Reed Sorenson Charity Golf Tournament Friday, Qualifying and Nationwide Race Saturday and then Sunday ooooohhhhh Sunday, Track Walk, PIT PASSES then Sprint Cup Racing under the lights in THE ATL. Life doesn’t get much better. 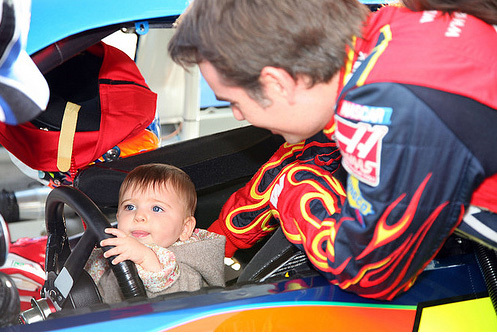 So here’s the #24 car and its driver with his beautiful baby girl. Okay if you’ve looked at this blog in the last two weeks you KNOW I’m going to the race in Atlanta Labor Day Weekend and now I have 41 days until I leave so I’m sharing my favorite for day 41. Reed Sorenson when he drove the #41. Until I’m on my way to Atlanta for the Labor Day Weekend and racing at Atlanta Motor Speedway. So for day 42 we must add a little bit of an international twist to the post. Nascar’s one and only Juan Pablo Montoya. I have to say that I am not a big fan of Juan the driver, but Juan the person is a very nice guy. Got to meet him at the golf tournament last year and he was very friendly and very gracious. Not to mention the fact that he’s supported Reed and his charity golf tournament from the beginning, even after they weren’t teammates. So Our picture today is me with Juan Pablo Montoya driver of the #42. Until I’m in Atlanta for Race Weekend. 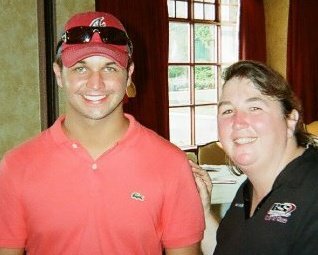 Okay here’s a picture from the Reed Sorenson Charity Golf Tournament at Eagle’s Landing Country Club last year. It was a beautiful day, the course was beautiful, the club was awesome. It was an all round fabulous day. Larry McReynolds , Kasey Kahne, Juan Pablo, Elliott Sadler, Kelly Bires and Rutledge Wood were some of the celebrities there. It was the perfect way to start out an awesome weekend. To top it off I got to spend some time with a friend I hadn’t seen since high school. 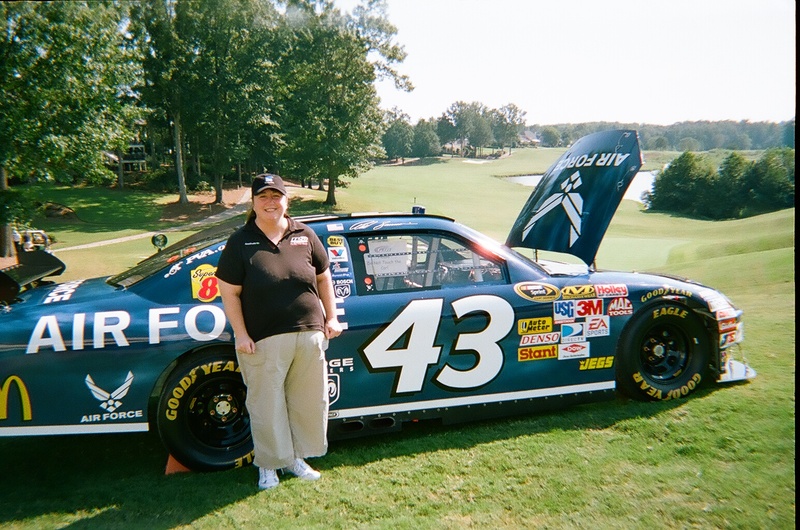 SO in honor of day 43 here’s me with the #43 car that was driven by Reed Sorenson in the fall race last year.